After the Marie Bulgin scandal rocked the Bighorn world many of us had hoped that the issue of disease transmission from domestic sheep to bighorn sheep might be largely resolved in the public debate. Recent news stories suggest otherwise. Likewise, there continues to be a lot of political posturing and spinning going on. Below are the recent articles, a general roundup of recent bighorn sheep issues that have hit the news with some added editorial comment – and perhaps a few insights that didn’t make headlines. “Butch” Otter is making a move to bring bighorn advocates back to his Bighorn sheep working group. Until recently, the only bighorn advocate participant on the panel was Western Watersheds Project. The governor apparently does not believe WWP to be adequately willing to enable his objective of the group. Most bighorn advocates are resisting the Governor’s effort, acknowledging the panel to be a shell game so long as S1232, a bill recently signed into law under intense pressure from ranchers & Marie Bulgin’s misinformation, mandates aggressive “control” of bighorn sheep. Neil Thagard of the Wild Sheep Foundation, based in Cody, Wyo., said his group has decided to return to the talks. Interestingly, the Wild Sheep Foundation’s (WSF) return to the table, presumably with its tail between its legs, follows the Idaho Department of Fish & Game recently awarding its prized Bighorn sheep auction tag to Sportsmen for Fish & Wildlife (sic) (SFW), an anti-predator group sympathetic to public land livestock grazing that has remained conspicuously silent on the bighorn controversy. The Department’s choice marks the first time it has ever withheld this valuable tag from WSF, who are largely responsible for the availability of the tag having spent considerable financial and legislative effort making it available to the Department years ago. The Wild Sheep Foundation had been suggesting it might encourage the Department to keep money generated from the tag away from Marie Bulgin’s controversial Caine vet lab. The subsequent decision to rip the tag away from WSF has many wondering whether the group is being punished for its decision to walk away from the bighorn collaborative following passage of S1232, or for its wish to keep the money out of a lab whose head is under investigation for a conflict of interest. It will be interesting to see whether the $100,000+ generated from the tag goes to the conflicted Caine vet lab under Sportsman for Fish & Wildlife’s (sic) influence. When IDFG was confronted as to why a commission meeting schedule/agenda was changed as suddenly as it was to rip the tag away from WSF, without adequately/fairly notifying WSF to prepare a response (a preparation it never before had to make), representatives of the Wild Sheep Foundation were encouraged to rejoin the Governor’s working group. Until recently, the Idaho Statesman has kept the benefit of the doubt with the domestic sheep industry. As the bighorn sheep controversy began to heat up, the paper never failed to give domestic sheep ranchers, Idaho politicians and their surrogate Marie Bulgin, of the Caine vet lab, ample opportunity to sow seeds of doubt about the science of sheep disease into the public debate. 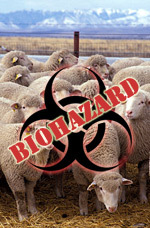 This has been done despite bighorn biologists nearly universal acknowledgment that domestic sheep do spread deadly disease to bighorn sheep and bighorn advocates’ consistently bringing to Barker’s attention, even before the controversy hit the news, Marie Bulgin’s conflict of interest. Does this mean there is no worry about mixing domestic sheep with wild bighorns? I haven’t heard any scientist say that including Marie Bulgin , the controversial University of Idaho veterinarian who is currently the subject of an inquiry at the school. But it does prevent bighorn advocates from saying that mixing of domestics with bighorns always leads to die offs like the ones we saw in Hells Canyon in 1995 and 1996, where 300 bighorns died. This statement sets up a false standard for bighorn advocates using an assertion that has never been made. Bighorn advocates have never claimed that there is a 100% likelihood that when domestic sheep and bighorn sheep interact that bighorns will die. We don’t have to in order to advocate separation. But the way this issue is used in this post suggests bighorn advocates have lost something. We haven’t, the urgency and importance of providing separation between domestic sheep and bighorn sheep still exists. The overwhelming science indicates that bighorn sheep and domestic sheep should be separated to maintain bighorn sheep viability. Whether disease is transferred 100%, 50%, 25%, or even 5% – when the two come into contact, that’s too much of a risk given the dire consequences of widespread bighorn die-off that could result. It may be that the Salmon River bighorn, which were not extirpated, have resistance other herds lacked. It may be that R14 leads us toward a public policy than reduces the controversy instead of fanning it. These false standards and the speculation that follows sets up a debate that has always endangered bighorn sheep. That one bighorn sheep did not have disease when seen no closer than 50 – 75 feet of domestic sheep does not suggest that Salmon River bighorn have resistance. It’d be like suggesting that if I walked within 50 feet of a mosquito with West Nile and was later found not to have caught the disease – maybe I’m resistant. Maybe, but maybe not – the incident with the mosquito does not shed any light at all on such a question. The suggestion is ridiculous and misplaced. With the Idaho legislature more than willing to ignore the best science and pass dangerous legislation on little more than conjecture – it is unfortunate and irresponsible for public voices to be stirring up even more unsubstantiated speculation and doubt about bighorn sheep vulnerability. Unfortunately, the conjecture all seems to cut the same way – against the welfare of bighorn sheep. 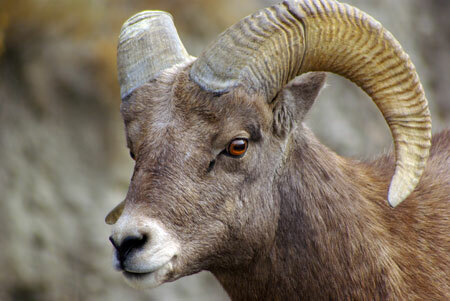 Western Watersheds Project has filed suit to protect bighorn sheep in Arizona. In the fall, farmers herd sheep from the Apache-Sitgreaves National Forests near Springerville to the northeastern corner of the Tonto National Forest near Heber, and then diagonally across the Tonto forest to its southwestern edge near Mesa, the lawsuit says. Not suprisingly, the move is controversial. What’s interesting about this story is that it is much like stories in places like Idaho. Ranchers themselves are quoted denying the likelihood of transmission of disease from domestic sheep to bighorn sheep as if they are scientifically qualified to do so. This is often the case around grazing issues but ultimately I think it says a lot more about the inability to find a qualified expert to deny bighorn vulnerability. I think Luci Scott of the Arizona Republic does a good job of bringing the experts in to dispel these unqualified claims. It will be interesting to see whether the public land ranchers in this area choose an alternative route or choose to truck their sheep in places rather than trail them. In Idaho, public land ranchers have been know to hold out – presumably on principle – against alternatives like trucking sheep even when bighorn advocates offer to pay – that is, they hold out until a court makes the decision for them. 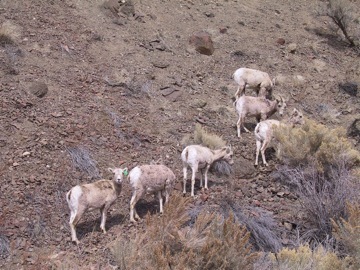 The money raised from the bighorn sheep auction tag stays with the Id F&G. The lottery tag money goes to the wildlife lab. SFW has the auction tag and WSF has the lottery tag.